The redesigned Web site for West Virginia Northern Community College has won the top award given by the National Council for Marketing and Public Relations, it was announced earlier this month at NCMPR’s annual conference in San Francisco. 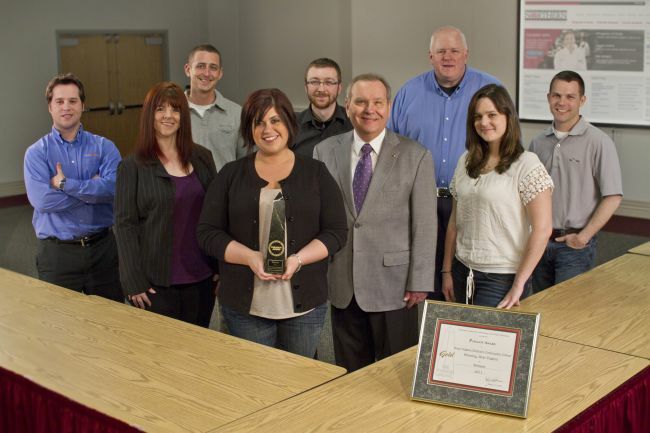 NCMPR's prestigious Paragon Awards recognize outstanding achievement in communications at community and technical colleges, and winners receive gold, silver or bronze designations. “We are extremely pleased that Northern’s Web site received the gold, or first place, in its category,” Dr. Martin J. Olshinsky, president, said. “The Paragon Awards is the only national competition of its kind that exclusively honors excellence among marketing and PR professionals at two-year colleges, and Northern is honored by the designation,” he added. Redesign of Northern’s Web site, www.wvncc.edu, was coordinated by the college’s Information and Technology and Community Relations departments. The bid to redesign the site was won by a Wheeling firm, Technology Services Group, Inc. Attending the San Francisco conference were Robert DeFrancis, the college’s dean of community relations, and Hilary Curto, Northern’s graphic arts designer senior and Webmaster. Curto received the gold award at the Paragon Awards ceremony and banquet held at the historic Fairmont Hotel which overlooks San Francisco’s famed Nob Hill. According to NCMPR officials, the judges numbered more than 80 marketing and public relations professionals from throughout the country that reviewed and scored the Paragon entries for 2011. There were nearly 1,800 entries in 44 categories from 276 two-year institutions in the U.S. Paragon Award winners hail from large, multi-campus districts and small institutions, from large staffs with healthy budgets and from one-person shops with limited resources. “All of them demonstrate that creativity, originality and unique approaches to problem-solving set the winners apart,” it was stated.